From late night phone calls asking for help, to learning how to interact with different religions and cultures, New Zealand Red Cross volunteer Lakshman Weerasinghe has seen a lot over the last twelve years. Lakshman has helped seven families who arrived as refugees settle into their new homes in Hamilton, introducing families from Afghanistan, Somalia, Colombia and Myanmar to Kiwi customs and ways of life, while getting them set up in their new homes. In the lead up to World Refugee Day on 20 June, Lakshman is taking part in Red Cross’ Stand in their Shoes campaign, swapping shoes and stories with someone new, while celebrating cultures. Lakshman’s first assignment as a refugee support volunteer was helping a Somalian family – a mother with twelve children – to find furniture for their new home, register with a doctor, and get acquainted with Kiwi culture. Learning about the family’s Muslim culture was important to his role, particularly as he needed to speak with the eldest son rather than the mother of the family. In order to communicate effectively, Lakshman waited until the eldest son returned home from school, to talk about what the family needed. At 11pm one night, he received a phone call – the son was exclaiming “Water, water!” Lakshman rushed around to the family’s home to see what was going on. He found the family gathered around the washing machine, which was spurting out water – they’d put their dinner plates into it, instead of the dishwasher. An emergency plumber fixed up the problem and they all shared a laugh over the misunderstanding. Lakshman is turning eighty this month, but shows no signs of slowing down. “From my younger days, I’ve had the chance to meet people from different cultures, one on one. I’ve always been interested in how we can learn from their cultures, and what they can learn from us. I want to spread my knowledge to other families – I’m quite proud to have helped many already, and I still keep in touch with them.” The eldest son in the Somalian family now has a family and a business of his own. Pictured is Lakshman, who was born in Sri Lanka, swapping shoes with Christian from Congo, as they share a bit about themselves. See New Zealand Red Cross’ Facebook, Instagram or Twitter pages for more information, or find out more here. Check out our photo gallery for more pics of people standing in one another's shoes. 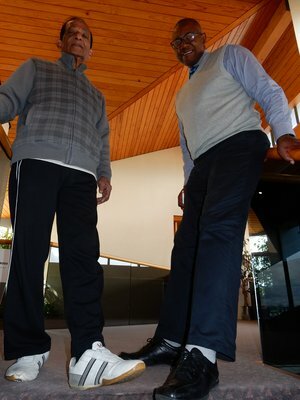 Lakshman, born in Sri Lanka, swaps shoes with Christian from Congo.